Not all donuts are created equal, and that’s quite apparent with many shops from around the world offering their own artisanal spins on the hugely popular fried (or baked) treat. Not all donuts are created equal, and that's quite apparent with many shops from around the world offering their own artisanal spins on the hugely popular fried (or baked) treat. Operating out of The Beast restaurant, these delectable gourmet donuts are only available on Thursday to Monday mornings. It's first come first serve, and you certainly want to be served. The new boys on the Toronto donut scene are already making waves with their unique offerings of savoury and sweet treats. Where else can you find dill pickle and jalapeño cheese flavoured donuts? With an ever changing menu, there's never a dull moment at Dynamo Donut. New seasons means new creations to try, but rest assured in knowing that the shop favourites are available all year round. Europe certainly isn't known for their strong donut game, which makes Riga's Ze Donats an even more outstanding find, with their expansive and rather colorful selection. Perhaps the most famous donut shop in Toronto, Glory Hole Doughnuts only serves the best, to locals and out of town visitors alike. Don't let the name fool you, these guys take their donuts seriously. 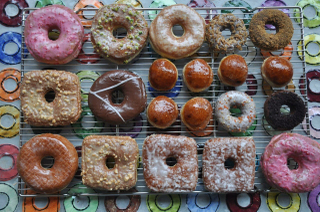 Top Pot is no stranger to the limelight as their donuts are award winning and renowned throughout Western Washington. While donut chains may dominate the market, Léché Desserts will give the Krispy Kremes of the world a run for the money, with their overtly gourmet beignes, as the Quebecois would say. Chez Boris isn't your average donut shop, as they're serving up Russian style donuts and even donut sandwiches amongst the more traditional offerings. Voodoo Doughnut has developed a cult-like following in Portland for both their wacky donuts, as well as their quirky shop culture. There's nothing like biting into a donut shaped like a voodoo doll! Fresh donuts made from the freshest of ingredients describes the Cartem's Donuterie agenda perfectly. The Doughnut Vault proves that a good old fashioned, chocolate glazed donut done right will still reign supreme in any scenario, and it has the line ups to show for it too. The Doughnut Plant might as well be an institution in New York, renowned for both their creative flavour combinations and donut toppings, as well as their utilization of quality ingredients. A joint operation with the famous Vancouver coffee roaster 49th Parallel, Lucky's will have you enjoying exotic donut flavors like earl grey lavender, and orange honey pistachio. While Bouchon isn't necessarily a specialized donut shop, their donuts will still blow your mind and taste buds away. Donuts are my food nemesis. I can never resist them! The photo from Leche Desserts in Montreal looks divine, and I wish I could go there right now to try them.